Ancient farmhouse of 1788, now completely restored and diveded into seven delicious and confortable apartments, is located on a hill overlooking the Val di Chiana, near Montepulciano, on the border between Tuscany and Umbria. You can find us in a very good place to visit, along the "Roads of Vino Nobile," centres of Montepulciano (10 km), Cortona (18 km), Sinalunga (22 km), Pienza (16 km) e S. Quirico d’Orcia (23 km), and also the nearby cities of art Siena (67 km), Arezzo (49 km), Perugia (51 km) and Florence (110 km) and known spas of Montepulciano (10 km), Chiusi (20 km)Chianciano Terme (16 km), Bagno Vignoni (24 km) and Rapolano (40 km). TULIPANI : Located on the ground floor, consists of a bedroom, bathroom with shower, huge living room with kitchenette sofa bed at 2 squares and fireplace. Reserved and equipped external area with beautiful sunsets!!!! ORTENSIE: Located at ground floor, consists of a bedroom, bathroom with shower , living kitchenette with sofa bed 1 ½ square and fireplace. Reserved and equipped external area with beautiful sunsets!!!! GLICINI : Located on the first floor, consists of a bedroom, bathroom with shower, large living room with kitchenette and sofa to 2 squares, sitting area with beautiful fireplace and another sofa bed. IRIS : Located on the first floor, consists of a bedroom, bathroom with shower, living kitchenette with sofa bed 1 ½ square and fireplace. PEONIE : Located on the first floor, consists of 2 bedrooms, bathroom with shower, large living room with kitchenette, sofa bed for 2 squares and fireplace. GIACINTI : Located on the ground floor, consists of a bedroom, bathroom with shower, living room with small kitchenette and sofa bed. Reserved and equipped external area with beautiful sunsets!!!! The house has 6 charming apartments (one equipped for disabled), all furnished with care and elegance, each with private bathroom, equipped kitchen with microwave and fridge, LCD TV, heating and air conditioning, fireplace, linens, tableware . Guests outdoor spaces for relaxing, swimming pool (Mt. 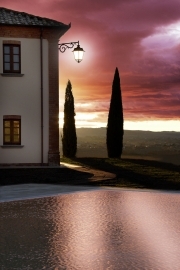 8x14) with Jacuzzi area and a lovely view, overlooking the Val di Chiana. Private parking. Wi-fi. Pets allowed. The Montepulciano 2283 is 350 meters away from the village of Valiano (with all kinds of shops) fraction of Montepulciano, easily reachable by car: highway hub of Chiusi Chianciano A1 (21 km) for those coming from South and the A1 highway junction Valdichiana / Bettolle (km. 12) for those coming from North. It is distant then approximately 25 km. from the railway station of Chiusi, 20 km. from the station of Terontola and approximately 4 km. from the small station of Montepulciano Station; Airports: the nearest airport is that of S. Egidio Perugia and is about 65 Km, then Pisa, Florence and Roma.